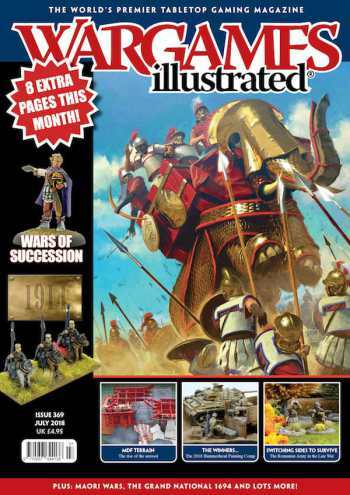 Simon MacDowall takes a look at wargaming with the successors of Alexander the Great. Great Escape Games came by to show us their new early World War One brigade level rules and some of their 12mm figure range. At the Society of Ancients Battle Day, the first major battle of the so-called Succession Wars, Paraitakene, was featured in a number of figure sizes and using different rule systems. Our report on the first painting competition we ran at this very popular show. Pete Brown and Jerry Richardson discuss their approach to gaming the Battle of the Boyne and the War in Ireland at a smaller scale than their norm. Barry Hilton fills us in on the process of creating (and performing!) this Tactica 2018 participation game. Nick Buxey presents one man’s obsession with the Battle of Almanza, 1707, a literal building project for the Like A Stonewall gaming group. Dom Sore shares his research on the Romanian Army in Late World War Two and offers some thoughts on a list to use with the Bolt Action rules. A close up look at some beautifully painted miniatures for a period when dash and fashion sense were an integral part of the frippery. Gary Faulkner is back with the second in his three part look at getting the best from the wood that gives gamers more. Mark Shearwood presents some thoughts on the ‘Glorious Revolution’ in England in 1688, and the game he created using his collection of figures and terrain. A trip to Hackley School in the USA, where historical wargaming is sponsored by the HMGS and the Battle of Borodino was re-fought in all its Napoleonic glory. Rupert Mitchell takes a browse through the 1/72nd and 1/32nd plastic products which are available for the discerning gamer. Looking for an Arthurian Warband for Dragon Rampant? Of course you are! Here’s one supplied by rules author Dan Mersey. Roly Hermans and chums decided to put together a game based upon the history of New Zealand and the early days of Empire, with a surprise attack on a farm. In the first of what we hope will be a regular feature, we take a journey to Rick Priestley’s home and explore his wargaming room.